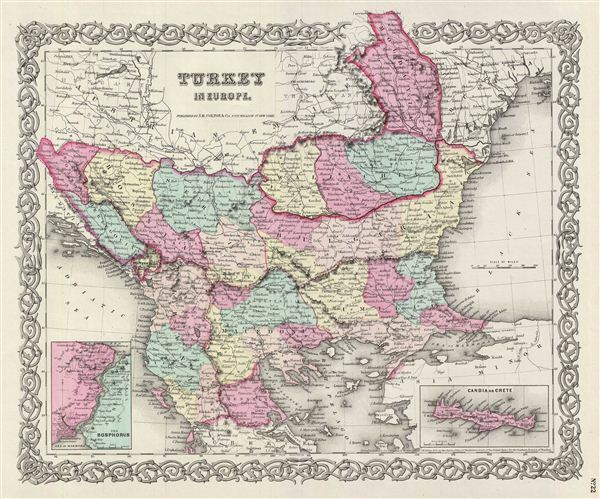 An excellent 1855 first edition example of Colton's map of european Turkey. Like most of Colton's europe maps, this map was derived from an earlier wall map of the world produced by Colton and D. Griffing Johnson. This map, made when the Ottoman empire controlled much of the region, covers what are today parts of Greece, Turkey, Macedonia, Albania, Bosnia, Serbia, Croatia, Bulgaria, Montenegro, and Moldova. An inset map in the lower left quadrant details the Bosporus and Istanbul (Constantinople). Another inset map, in the lower right, focuses on the island of Candia or Crete. This map depicts the waning years of Ottoman hegemony in the region, with the Greek Independence movement achieving Peloponnesian soverignty in 1821. The Ionian Republic, under the protection of Great Britain, was also free of Ottoman control. The other Grecian and Balkan states, including Serbia, Croatia, Moldavia, Wallachia, Albania, and Macedonia, remained at least nominally under Ottoman control until 1878. This map also identifies various cities, towns, rivers, rapids, mountain passes, and an assortment of additional topographical details. Map is hand colored in pink, green, yellow and blue pastels to define national and regional boundaries. Surrounded by Colton's typical spiral motif border. Dated and copyrighted to J. H. Colton, 1855. Published from Colton's 172 William Street Office in New York City. Issued as page no. 22 in volume 2 of Colton's 1856 Atlas of the World. Rumsey 0149.089 (1856 edition). Phillips (Atlases) 816.